To tie flies in the 'traditional' manner, the trout angler must use all natural materials. Place a hook in your vice and attach gray tying silk, winding from the eye to the tail position. Strip the flues from a grizzly hackle and a brown hackle feather, mix the fibers and tie in at the tail position. Select some gray underfur from a muskrat pelt, remove any guard hairs, and dub a tapered body. Select two hackle feathers, one from a grizzly neck and one from a brown neck. Tie in at the wing position and wrap. Whip finish head. If wings are desired use grizzly hackle tips, tied upright or spent. When I started tying flies over 35 years ago those were the instructions given for tying the standard Adams dry fly. All natural material was used to tie this fly, from the tying silk to the body fur. There were no artificial materials, it was fur, feather and steel. This had been the pattern for the construction of artificial flies for over 300 years. Many modern fly tiers, especially those who have only been tying for a few years, may never have used any of the natural materials, except hackle, that formed the basis for fly tying since its inception. Most artificial flies tied today truly are artificial. Synthetic fibers of every description have replaced almost every component used to construct an artificial fly. The only major component that has yet to be successfully duplicated by synthetic materials is hackle. The chicken is still king in this department. What the modern fly tyer has gained in this avalanche of artificial materials is the ready availability of materials in any color and texture desired, without spending time procuring and dying the material. Many of the colors available in synthetic materials cannot be duplicated with natural materials, and the range of hue and intensity is unobtainable in dyed natural materials. For anglers who tie salt water flies and Atlantic Salmon patterns the modern synthetic materials have been a tremendous blessing. However, for the trout angler the advantages of synthetic materials is not as well defined, and the angler who wishes to tie his trout flies in a 'traditional' manner will find the materials readily available and well suited for his needs. Natural furs made up the bulk of the fly tyer's kit just a few short years ago. Heading the list were furs from animals that live in the water; muskrat, mink, otter and beaver. Pieces of these furs could be used in their natural state, or bleached and dyed in a variety of colors. Natural furs generally consist of a coarse outer coat, and a softer inner coat. The outer coat contains stiff hairs called guard hairs. These stiff hairs take the wear caused by the animals activities, thus protecting the under coat from excessive wear. The undercoat is composed of dense, fine fur that provides the animal with warmth. On animals that live in water this under coat is usually quite dense, and tends to keep the water from reaching the animal's skin. When not in the water these animals spend much of their time grooming their fur to insure that it retains its' insulating qualities. By grooming they keep their fur from becoming matted, and the grooming process spreads a natural oil throughout the fibers, enhancing the waterproofing character of the fibers. 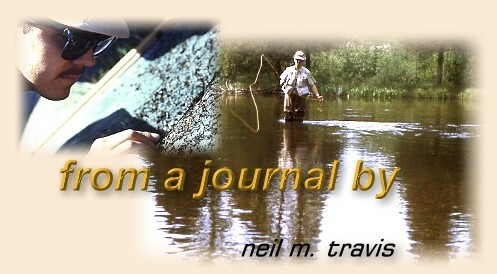 Muskrat and beaver fur are excellent furs for dry fly bodies since they are very water resistant. The fur ranges from light gray to a dark blue gray. The outer guard hairs, especially on the beaver, make excellent tails. Otter fur is light tan to dark brown, and makes an excellent coarse dubbing when the guard hairs are mixed in with the softer underfur. There are other furs from animals that do not frequent the water that also provide excellent dubbing material. Years ago there was a company called 'Herters' which sold all manner of sporting goods. They were one of the first and largest catalogue sporting goods retailers, and they carried a large selection of fly tying material. I ordered a selection of there 'Belgian Mole Skins,' which they sold in a variety of natural and dyed colors. The fur is very fine and makes excellent dubbing. I still have several of those skins along with several 'native' moles that I trapped and skinned myself. Rabbits provide the tyer with a variety of material useful for fly tying. The body fur comes in a variety of colors and is easily dyed. Vince Marinaro in his classic book, A Modern Dry Fly Code, set forth a receipt for making 'Yallow Carrited Stuff,' from a book published in 1876 entitled, Quaint Treatise on Flees and the Art A Artyfischall Flee Making, by Aldam. By placing white rabbit fur in a solution of nitric acid and water, the fur takes on a sulfur-yellow color. Vince used fur this for tying his Sulphur Duns and spinners. Rabbit ears, or more properly Hare's Mask and ears, provide the tyer with a variety of fur, from soft to bristly. The Gold-ribbed Hare's Ear is still a very productive fly, and is an excellent nymph imitation for many types of mayflies and caddis. Rabbit skins are also cut into strips and used for tying a variety of streamer flies. Common rabbit fur is a very useful and versatile material that is readily available for the fly tyer. Other furs used by fly tyers are Australian opossum, raccoon, nutria and seal. Various types of hair are used by fly tyers when tying traditional flies. Hair from certain parts of deer, elk and antelope are hollow. This hollow hair can be spun on a hook shank, clipped and formed into compact fly bodies for dry flies, or for the heads of streamer flies. Moose hair, especially the long hair found on the mane, is very useful for tying bodies for midges and mayfly spinners. The fly tyer takes a single hair and wraps it on the hook shank to form the body of the fly. Given a thin coating of fly head cement will produce a realistic and durable body. Old flying tying books mention the use of horse hair for tying flies. This is the hair taken from the mane and tail of the horse. It is extremely strong, and comes in a variety of colors. Horse hair, unlike moose hair, is normally quite thin so the fly tyer may need to wrap several layers on the hook to achieve the desired results. Since this hair is quite strong it makes excellent ribbing for smaller flies. Bear hair, bucktail and calf tail hair make excellent streamer and bucktail wings. Many tyers have substituted one of the various synthetics in place of these natural hairs, but the natural hair still has many advantages. Natural hair generally has a softer look and feel that may cause the fish to hold the artificial in its mouth a little longer, giving the angler more time to set the hook. Unlike synthetic material, natural fur and hair requires some care in handling and storage. Since natural materials will attract moths and beetles that feed on the fur and hide, it necessary to protect them. I have found large mouth glass jars make the best storage containers. I obtained my storage jars from local restaurants. These jars contained mayonnaise, mustard, pickles, and similar bulk foods. I would wash them, remove the label from the outside and let them dry thoroughly. The jars have tight fitting lids that keep out even the most persistent moth or beetle, and the contents are easily seen from the outside. To insure that no hitch-hiking bug comes in on the material I drop a moth ball in each jar.